What’s as fast as lightning and recharges in a flash? The OPPO Find X Automobili Lamborghini of course! The top-range smartphone comes with the customary technology of other flagships along with a new super-fast charging system. How does it work and how fast is the Super VOOC recharge? You can find out here! OPPO is certainly not the first company to boast a new, revolutionary and unique rapid charging system that will make you forget the disastrous battery life of your Android device. The difference is that OPPO is serious when it promises super-fast recharging. Do you remember Dash Charge (later renamed Warp Charge) from OnePlus 6? The fast charging system used on OnePlus smartphones was based on OPPO’s Voltage Open Loop Multi-step Constant-Current Charging (VOOC) system. This now “old” fast charging system that OPPO launched in 2014 on R5, allows you to charge the battery of your smartphone by increasing the intensity of the current without changing the voltage. VOOC-compatible chargers usually use an output voltage of 5V and reach 4A for a total of 20W of power. Using an OPPO pulse system can keep both the battery and the outlet relatively cold without risking anything in terms of safety. Together with the OPPO Find X, the Chinese company also presented a special version of its smartphone during an event at the Louvre in Paris. 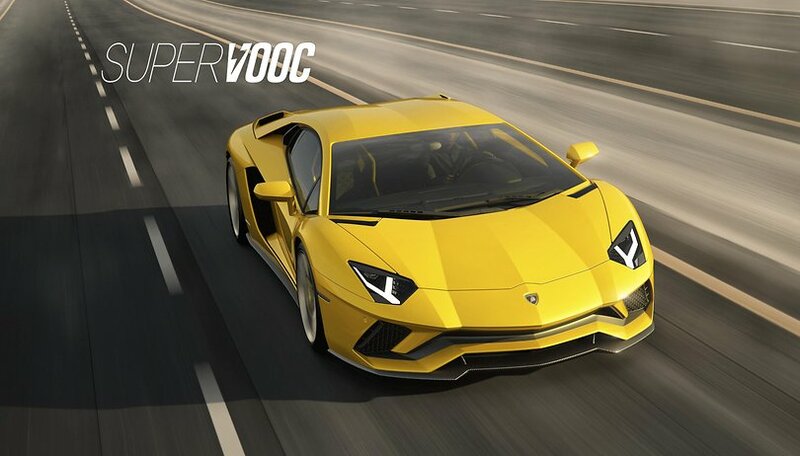 The OPPO Find X Automobili Lamborghini Edition came to the market with a new charging system called Super VOOC. The Super VOOC charger has an output of 10V and 5A for a total of 50W of power. This allows the 3400 mAh battery to recharge in just 30 minutes from 0 to 100%. We’ve compared it to Qualcomm’s most popular charging systems and the results speak for themselves. The new charging system allows you to recover as much as 41% of the battery in just 10 minutes, allowing you to give new life to your smartphone in a flash. But how is that possible? OPPO uses a trick to maximize the yield of its new Super VOOC recharge. Instead of using a single 3400 mAh battery, the company has inserted two 1700 mAh cells into the Find X, which can be recharged very quickly. That explains the mystery! I would like Samsung, Huawei and others to use this technology as well. Given the incredible battery life of the Chinese smartphone, the Super VOOC charge will definitely change your charging habits. You can safely consume every last mAh of the battery and then recharge it while you’re in the shower, cooking or watching TV. Your smartphone will be ready for action before you know it. Here in the editorial office, we of course all knew about VOOC recharge, but experiencing it for yourself will leave you completely amazed. What do you think? Would you like other manufacturers to use this fast charging solution? This isn't new technology to have cells in serial/parallel arrangement. You put them in parallel configuration for charging and a serial configuration to power devices. This allows you to charge very rapidly and not eat the batteries. This might be the first time used in a phone. The problem I have with "super fast" charging, is that it can impact the life of the cells inside of the battery, over time. Fast charging requires ramping up the amount of current sent to the cells of the battery, which can heat up the battery pack, and can reduce the life expectancy of the battery pack. But, LOL, given people toss these things away every 12-24 months, maybe it won't be an issue. Not much heat is generated when using super VOOC Charging.